The global audiological devices market is expanding due to the increasing number of cases of hearing loss across the globe. 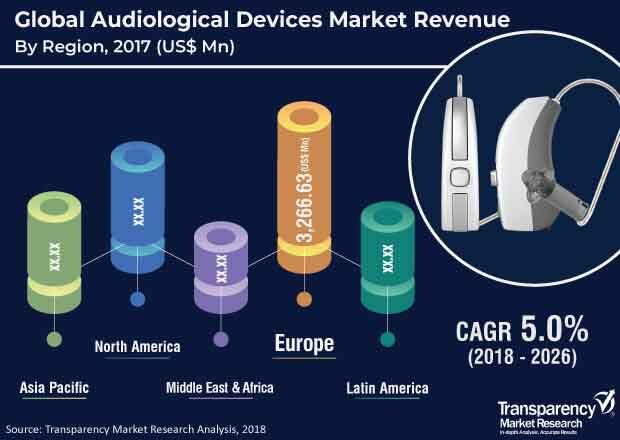 The global audiological devices market was valued at about US$ 8.7 Bn in 2017 and is expected to reach a value of US$ 13.4 Bn by 2026, expanding at a compound annual growth rate (CAGR) of over 5.0% from 2018 to 2026. The global market is witnessing expansion at a relatively higher growth rate owing to the increasing geriatric population, adoption of audiological devices due to rising number of cases of hearing loss, and surge in research and development in both developed and developing markets. Deafness is caused due to impairment in the ear or damage to the hearing related nerves. Causes for these defects are injuries, congenital defects, diseases, age-related factors, occupational hazards, and exposure to loud noise. Audiological devices are broadly categorized into treatment or supporting devices that help enhance hearing ability of patients and to monitor or study hearing. Technological advancements in audiological devices, high prevalence of hearing problems in the geriatric population, and an increase in incidence of impairment and loss of hearing among the younger generation are key factors driving the market. Moreover, cosmetic appeal of audiological devices and rising prevalence of deafness, efficient devices (such as wireless devices), cost-effective, and widespread awareness, and acceptance of novel devices among the population are anticipated to boost the global audiology devices market in the near future. The global audiological devices market has been segmented based on product, disease type, end-user, and by region. In terms of product, the market has been categorized into hearing aids, cochlear implants, bone-anchored hearing aids, and diagnostic devices. The hearing aids segment has been further sub-segmented into in-the-ear hearing aids (ITE), receiver-in-the-ear hearing aids (RITE), behind-the-ear hearing aids (BTE), and canal hearing aids (CHA). Moreover, the diagnostic devices segment has been further split into audiometers, octoscopes, and tympanometers. Hearing aids are expected to hold a significant share of the market, as hearing aids are most useful for the majority of individuals with mild to moderate hearing loss. Due to increasing severity of hear loss, the cochlear implants are forecasted to grow with a significant CAGR during the forecast period. In terms of disease type, the global audiological devices market has been divided into otosclerosis, Meniere's disease, acoustic tumors, otitis media, and others. The Meniere’s disease segment is projected to hold a prominent share of the market, and is also anticipated to expand at a significant CAGR during the forecast period. According to American Hearing Research Foundation, in the U.S., approximately, 0.2% of the population has it, and every year about 45,500 new cases are diagnosed. In terms of end-user, the global audiological devices market has been split into hospitals, ambulatory surgery centers, and clinics. The clinics segment is projected to dominate the market, and is expected to expand at a significant CAGR during the forecast period. In terms of region, the global audiological devices market has been segmented into North America, Europe, Asia Pacific, Latin America and Middle East & Africa. Europe is expected to dominate the global market and account for a prominent share of the global market. The market in Europe is primarily driven by a rise in the geriatric population, surge in patient population, and high prevalence of hearing impairment, injuries, increasing technological advancements, and development of advanced products in the audiological devices market. The market in Asia Pacific is anticipated to expand at a significant growth rate during the forecast period. This is due to the presence of large geriatric population, governmental initiatives taken in the healthcare field, increasing research and development activities, improving healthcare infrastructure, and rising incidence of deafness in the region. Technological advancements, rising approvals from government bodies, and strengthening of sales and distribution network are key trends in the global market. Key players operating in global audiological devices market and profiled in this report are William Demant Holding A/S, GN Store Nord A/S, Sonova, WIDEX A/S, Sivantos Pte. Ltd., Medtronic, Starkey, Audina Hearing Instruments, Inc., AUDITDATA, and Nurotron Biotechnology Co. Ltd. This report analyzes the global audiological devices market in terms of its current and future scenario. Hearing impairment or hearing loss occurs when there is an issue with one or more parts of the ear - the part of the brain that is responsible for controlling the hearing or the nerves in the ears - thereby reducing the ability of hearing. ‘Impairment’ means something is not functioning appropriately or correctly, as it should. In hearing loss, the person may be able to hear some sounds or nothing at all. The cause of hearing loss can include age and exposure to loud noise, which are considered to be the two most common causes. According to WHO, hearing loss may result from complications at birth, genetic causes, chronic ear infections, certain infectious diseases, the use of particular drugs, exposure to excessive noise, and ageing. Around 60% of childhood hearing impairment is because of preventable causes. Around, 1.1 billion young people (ages between 12–35 years) are considered to be at risk of hearing loss due to exposure to noise in recreational settings. Audiological devices comprise instruments used for the diagnosis and treatment of hearing impairment. This report on the global audiological devices market comprises an elaborate executive summary, including a market snapshot that provides information about different segments of the market. The report also provides information and data analysis of the global market with respect to its segments based on product, disease type, end-user, and geography. A detailed qualitative analysis of drivers, restraints, and opportunities of the market has been provided in the market overview section. Moreover, the section comprises the company profiles with a business overview to project the competitive landscape of the market. It also provides market attractiveness analysis in terms of geography, and market share analysis by key players, thereby presenting a thorough analysis of the overall competitive scenario prevailing in the audiological devices market. Based on product, the global audiological devices market has been segmented into hearing aids, cochlear implants, bone-anchored hearing aids, and diagnostic devices. The hearing aids segment has been further divided into in-the-ear hearing aids (ITE), receiver-in-the-ear hearing aids (RITE), behind-the-ear hearing aids (BTE), and canal hearing aids (CHA). Additionally, the diagnostic devices segment has been further divided into audiometers, octoscopes, and tympanometers. In terms of disease type, the global audiological devices market has been classified into otosclerosis, Meniere’s disease, acoustic tumors, otitis media, and others. In terms of end-user, the global audiological devices market has been divided into hospitals, ambulatory surgery centers, and clinics. The global audiological devices market has been analyzed based on technology trends, research and developmental activities, and presence of key players in the region. Market size and forecast for each of these segments have been provided for the period of 2016 to 2026, along with their respective CAGR for the forecast period from 2018 to 2026, considering 2017 as the base year. In terms of region, the global audiological devices market has been categorized into five major regions and key countries in these regions: North America (the U.S., Canada), Europe (Germany, the U.K., France, Italy, Russia, Spain, and Rest of Europe), Asia Pacific (China, India, Japan, Australia & New Zealand, and Rest of Asia Pacific), Latin America (Brazil, Mexico, and Rest of Latin America), and Middle East & Africa (GCC countries, South Africa, Israel, and Rest of Middle East & Africa). Market size and forecast for each of these regions and their key countries have been provided for the period from 2016 to 2026, along with their respective CAGR for the forecast period 2018-2026, considering 2017 as the base year. This report also covers the competitive scenario of the market in these regions. The report profiles major players operating in the global audiological devices market in terms of attributes such as company overview, financial overview, product portfolio, and business strategies. Major companies profiled in this report are William Demant Holding A/S, GN Store Nord A/S, Sonova, WIDEX A/S, Sivantos Pte. Ltd., Medtronic, Starkey, Audina Hearing Instruments, Inc., AUDITDATA, and Nurotron Biotechnology Co. Ltd.